Son of a Jewish banker and grandson of the philosopher Moses Mendelsohn. His family converted to Christianity in 1816. He was a child genius and performed with his sister Fanny. He was taught piano by Ludwig Berger and composition by Carl Friedrich Zelter. When he was 20 he produced his first piece and from then the music flew from his hands. In 1821 he had met Goethe, whose poetry influenced his early writing. From 1826 until 1829 he studied at the University of Berlin. He became famous in Berlin after he directed a performance of the long lost "Matthäus Passion" by Bach at the Singakademie. From 1829 to 1831 he travelled to Italy, France and England to give concerts. In 1833 he became musical director in Düsseldorf and in 1835 Gewandhauskapellmeister in Leipzig, the youngest person ever to get that important position. He enlarged the orchestra with 50 musicians and put Mozart, Beethoven, Schubert, Chopin, Liszt and Schumann on the program. In Leizig he married Cecile Jeanrendaud, the daughter of a clergyman. After an appointment as general musical director in Berlin (1841) next to his duties in Leipzig, he was a co-founder of the conservatory in Leipzig in 1842. There he and Schumann taught composition and piano. In 1844 he met the Swedish singer Jenny Lind and they became close friends. Mendelsohn worked much too hard and travelled too much and the death of his sister Fanny from a stroke in May 1847 was a heavy blow to him. Soon afterwards he suffered a stroke himself and his recovery went very slowly. After a stay in Switzerland he returned to work, but soon he had a second stroke which left him partially paralyzed. He died in November 1847, only 38 years old. The grave of Felix Mendelsohn-Bartholdy at the Dreifaltigkeitskirchhof I, Halleschen Tor, Kreuzberg, Berlin. 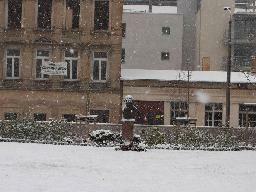 Bust of Felix Mendelsohn-Bartholdy in the garden of the house where he lived in Leipzig. 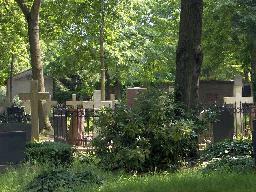 The gravesite of Felix and Fanny Mendelssohn-Bartholdy at the Dreifaltigkeitskirchhof I, Halleschen Tor, Berlin.